Scientists, with the help of seals, have solved a 30-year mystery surrounding the formation of the global ocean’s coldest, deepest waters. Until now they had known that the cold, dense bottom waters of the global ocean originated at three different locations in Antarctica – the Weddell Sea, the Ross Sea and the Adélie Coast of East Antarctica. Thirty years ago, a fourth source was speculated to exist somewhere in the Prydz Bay region, but until now scientists have been unable to confirm if, where and how it is being formed. The research is published today in the journal Nature Geoscience. Its significance is underlined by the fact that Antarctic bottom water is a key driver of the global ocean circulation and therefore of the earth’s climate. The newly identified source is different from the other three sources. Its existence demonstrates that polynyas (areas of open water surrounded by sea ice) are capable of forming sufficiently dense shelf water over a narrow section of continental shelf without the traditional assistance of a large ice shelf or coastal storage volume. This opens the door for further discoveries of Antarctic bottom water production from the other polynya regions around the Antarctic coastline. 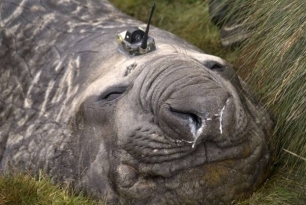 This entry was posted in news and tagged antartic, Scientists, seals. Bookmark the permalink.